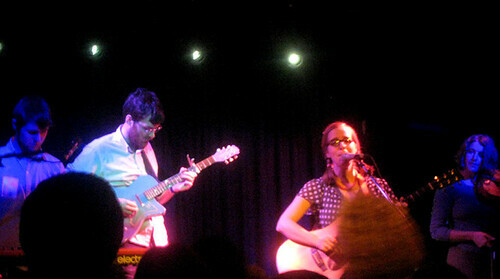 Kid Vinyl met Laura Veirs over a table at Bristol’s Hole in the Wall shortly before her show on board the good ship Thekla on January 25th 2010, and asked her a few questions. KV: Firstly, Could you tell us a little about who you’re playing with this tour, who’s in your band? LV: Sure, yeah. Alex Guy is from Seattle and she plays viola and sings, and she has a side project called Led to Sea, and she’ll be opening some of the shows on this tour. The other two guys are also opening the shows. One is named Eric Anderson, and he’s from Seattle also, and his project’s called Cataldo; and the other guy is Nelson Kempf, and his project is the Old Believers, and he usually plays with more people, but right now he’s on his own. KV: So they’re all playing support? LV: Yes, and they’ve all played in different bands and have their own projects. Nelson and Eric are 21 and 23, Alex is 34, and I’m 36, so it’s a pretty wide age range, but it’s been working out well. They’re really good singers and they’re all really good musicians, they play multiple instruments, so Nelson plays the keyboard, bass, and guitar, and banjo; Alex plays keyboard, and viola, and sings, and Eric does them all; and I think I do almost all of them too, so there’s a lot of shuffling around on stage, but I don’t think it’s too chaotic seeming – mostly I’m playing acoustic guitar, but some electric and some banjo. KV: Thank you. A lot of your songs conjure images of landscapes and the sea. I was wondering, do you think that where you’ve been based over the last few years, in the Pacific North West has a particular influence on that, and maybe if you lived further east, somewhere more flat and landlocked in the Mid West, it might come out a little differently? LV: Yeah, I think certainly the nautical stuff has had an influence from the North West, but on the new record I must say I was kind of purposefully avoiding the nautical imagery because I’d used it a lot, and I was trying to surprise myself, and not use the same old stuff, but I mean, in general the landscape that you hear about on this new record is American. It’s not French, it’s not like there are buffalo running around in France, so it’s certainly based in the US landscape overall, but I would say more like the pastoral West, which is where I grew up, than the Pacific North West. KV: And do the kinds of images that you like to use in your songs reflect the stories that you relate to most personally? Maybe growing up did you have some favourite fables? LV: Not really, but I think probably the growing up thing that influences me most now is just having done a lot of outdoors stuff with my family, camping trips and canoe trips, mountaineering trips, and climbing really tall mountains; like spending three months every summer doing all that stuff because my parents were both teachers so they could take the time off in the summer to do that. So I’d say as far as nature images go they’re coming from this bank of experiences that I logged when I was a kid. KV: Cool. And do you still get out into rural Oregon? KV: Now, the song ‘July Flame’ mentions Will O’ The Wisp. Have you ever seen them? KV: It’s real. I think. I think people argue about the causes. LV: Yeah, right. But what you‘re saying is it’s confirmed that people see something, but they don’t know what causes it? KV: Yeah, and I think they’ve been replicated with decaying organic matter in labs. LV: Oh really? I saw that term in a Jose Saramago book and thought ‘what is that? That’s cool’, looked it up and then put it in a song. KV: Is a July Flame something particular? LV: …but also it has so many other meanings like, y’know, a flame could be like summer love, it could be the warmth of a fire that’s very protective, it could be the destructive force of a fire, y’know, there’s a lot of different… like, it’s a very open thing. So I like that for a title. LV: … over here on Bella Union. Bella Union is a great label too, I just didn’t want to forget about them. KV: The Cocteau Twins connection! KV: Ummm, and you’ve been quite assiduous about blogging and posting tweets on Twitter and things. Do you find being really hands on in ways other than writing and performing the songs is a really rewarding thing, or do you… compared to, y’know, letting a label and press machine take care of all that? LV: Right. Yeah, I mean, I’ve never done a blog before this tour, and I find it really fun just because I have a really easy website upload system and an easy camera that’s on my phone, and just take the picture, upload it to the website, write a little thing, and it’s done in like five minutes, and so it’s very low…, it’s a very small amount of effort I feel too, but a pretty good reward for me, which is that it’s a catalogue of my trip, and this is going to be my last trip without being a mom, and I’m kinda like wanting to do something to explore my last days of freedom before I’m like tied down to somebody else, y’know, all the time, so in a way it’s just been nice to be like ‘oh yeah, this is a running story of this trip’, which is a specifically unique trip for me, and I don’t know if I’ll have the energy or time or gumption to do it again, but it’s such a long tour, y’know, it’s like two months, and we’re covering so much ground, like all over western Europe, and a really huge portion of the United States, that I feel like I’m really looking forward to looking back actually at the pictures, so I can say ‘oh wow’, just the vast distance covered and the different things that I’ll notice and see again. It’s been pretty fun. And, y’know, label, they can’t do that, that’s really just specific to an artist having extra motivation to do something else on the road. Umm, the Twitter stuff and running my own label with my friend Chad, that’s… all that’s fine, but this is more personal, and I enjoy this blogging stuff a lot, and I mean running the label’s just tons of work. It’s worth it though, it feels very, like, kinda like a family business. Yeah. LV: Oh yeah! Was he a guest with Two Beers Veirs? LV: Oh good. That’s funny. It’s cool you saw us there. KV: …and you played ‘Annabelle’ I think, by Gillian Welch, which is a favourite of mine, so it was cool to see that, but do you have any plans to record with, or tour, the Two Beers Veirs band? KV: I mean, of course Jon [Neufeld]’s on July Flame isn’t he? KV: Oh yeah, how did it go? LV: …and we always, we hope to keep at least the New Years tradition going, and I did do an EP, y’know, for that, but it’s really just a side thing that’s fun for me, it’s not much of a something I’m gonna pursue. KV: Well it was really cool!